Beaches Turks and Caicos is one of the most beautiful resorts that I have ever been to, and it’s perfect for a family vacation. Because we are a family that loves to travel, I’m on a mission to find and report on places that our newly minted tween can enjoy just as much as we do. Travel with Tweens can be tricky! On the one hand, they don’t want to be with their parents all day. But on the other hand, they are not quite old enough to be left alone for long periods of time! Vacationing at this age gets just a little bit more complicated trying to please everyone. But try traveling with tweens at Beaches Turks and Caicos Resorts! We went back in October and our entire family was happy! 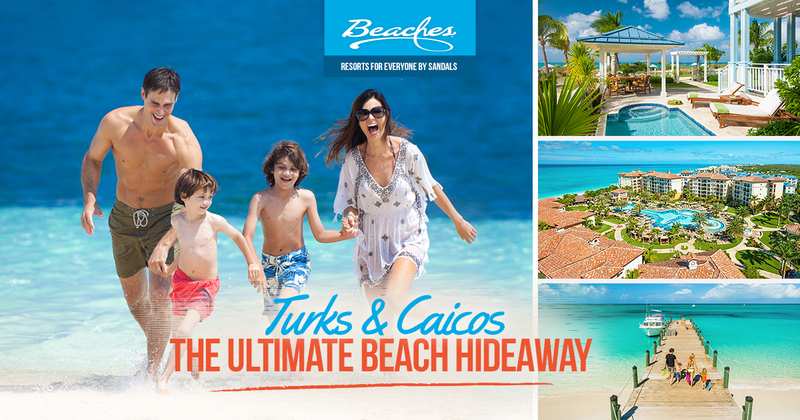 Beaches Turks and Caicos is located on 12 miles of beach voted The World’s Best beach by Trip Advisor’s Travelers Choice Award. With 20 restaurants and bars, six pools, camps for kids and a great waterpark, it’s the perfect all-inclusive resort for a family vacation with your tween. The resort consists of 5 Main Villages: The Caribbean, The Seaside, The Italian, The Key West and French Villages. Each village gives you a different experience all of the same resort. A basic room includes either two full sized beds with a small couch or a King with a Trundle bed. If you need more space, some of the villages have 2-3 bedroom suites, family suites and villas! All of these options for your family give you and your tween the space they need while keeping the family together for a family vacation! Each morning, you can sign your kid into the kids club giving details such as your room number, your phone number, any allergies, and special needs. And then not see them again until Dinner time. All day, every day, the kids have access to endless organized activities including swimming and games. Tweens are still kids! And the Water park is designed for endless fun! From the lazy river to the 5 water slides, it’s the perfect place for your tween to hang out all day. Which is perfect while you lounge on a chair under the shade with an adult beverage and a good book. Or you can join them! And if they get bored with the adventures there, the water park includes a Surf Simulator. Kids and their parents alike can have fun here! If you have a kid who is a gamer, yes, they can spend endless hours playing games on the Xbox. But as a parent, I hear you saying: we went on vacation to get them AWAY from screentime! Trust me when I say that it is so much for them to do that it won’t be the only thing that your tween wants to do! I have to mention the beach. Beaches Turks and Caicos is located on Grace Bay which has calm and clear water! This makes it the perfect beach for kayaks, windsurfing, snorkeling, paddleboarding and more. There are 22 Dining Options for you and your tween at Beaches Turks and Caicos. Even the pickiest eater can find something to eat! 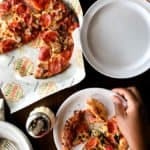 And if your tween has food allergies, Beaches is wonderful and well equipped to handle food allergies and make sure your kid has something to eat always! There are burgers and fries and pizza and ice cream galore! And for the rest of us, there are dining options such sushi, a steakhouse, tex-mex and so much more. And they will enjoy it all and never go hungry. So what is there for the Parents? The simple answer is: whatever you like. While your Tween is occupied with everything I’ve talked about above, you can spend your time at any of the 12 pools ( including this adult only one), or enjoying the drinks, food trucks, the restaurants or naps in the shade on the beach. In the end, the options for tweens at Beaches Turks and Caicos resorts are endless. This makes it the perfect spot for your next family vacation. So, have you ever been to Beaches Turks and Caicos? Where are your favorite spots to take your tween? 7 reasons for couples to go to Beaches Negril…without their children. This is perfect! So glad they offer so much everyone in the family to enjoy. They have amenities for kids and adults only. Would love to spend a holiday there!